Welcome to Savor the Science! In each Savor the Science, RENDER’s resident chemist, Claire Lower, will explore culinary questions through a scientific lens, perfecting recipes and demystifying techniques. Theories and reactions will be discussed and experiments will be performed; it’s like your high school chemistry class, only edible. Twice a month, Claire will take a scientific concept (such as the acid-base reactions in baking, macerating, or Maillard browning), explain it in a way that would make Bill Nye proud (hopefully), and then provide an edible experiment which allows you to demonstrate your new scientific food knowledge. Note: Savor the Science is taking a short break, due to the fact that Claire is in Sacramento, away from her kitchen, tools, and all of her books. Given that 2015 is right around the corner, Claire is taking this opportunity to talk culinary resolutions, and providing you with the resources to meet yours. 2014 flew by so quickly that it's likely that some of your New Years resolutions might've fallen by the wayside. At this time last year, you probably had every intention of learning how to roast a duck, bake your own bread, or steep your own cocktail bitters. Or maybe you just wanted to decrease your take-out consumption and cook your meals at home. However big or small your culinary resolutions were for the year, it's safe to say you're not alone if you didn't manage to check every single one off your list. As for me, I thought 2014 was going to be the year of DIY condiments. I had grand visions of making my own mayo, ketchup, and pickles. Out of those intended condiments, I managed to make ketchup and pickles, but only once each. I did, however, start making my own pasta sauce (using this iconic recipe), and that one has stuck. But 2015 is a new year! And this year, we are going to set and meet our culinary goals. The key is to not try and take on too much all at once. Set a small goal, like learning to properly roast a chicken, and don’t even think of adding a new one until the first one is reached. Once you've mastered the cooking of the bird, then learn to carve it. Below are a few of techniques I hope to master this year, along with the tools, books, and resources I plan to take advantage of. Given that they aren't too lofty – surprisingly, these resolutions have nothing to do with molecular gastronomy – it’s entirely possible that you share at least one (if not all) of these same goals. It’s all well and good to buy a block of knives at Macy’s and call it a day, but if you really want to get serious about cooking, a proper chef’s knife is required. I’m not totally sure how I've made it this far without buying one, but I suspect it has something to do with my laziness; fancy knives are a little high-maintenance—you can’t just throw them in the dishwasher. Buying a knife is a very personal decision. Different cooks have different needs (and different hands), and a home cook’s knife isn't going to see the same amount of work as a professional chef's. This guide by Chef Samin Nosrat (teacher of Michael Pollan and Chez Panisse alum) is the perfect starting point for home cooks ready to step up their knife game. The Food Lab has a great breakdown as well. If you’re a bit advanced, and already have a good stainless steel blade, perhaps you’re ready for a carbon steel option. It embarrasses me to say this, but I have no idea how to clean a fish or butterfly a chicken. Though some would argue that that’s what butchers are for, there’s something empowering in knowing how to properly break down and process an animal. But Camas isn't the only woman revolutionizing our relationship with meat. On the East Coast, Kari Underly of Range Incorporated runs the Muscolo Meat Academy, where students can learn a whole animal approach to butchery, along with charcuterie and cooking applications. If you aren't in an area that offers butchery classes, I recommend taking advantage of PMC’s resources page, which lists tons of books, blogs, and films to arm you with the knowledge needed to be your own butcher. And if – even after all that reading – you have a meat-centric question you can’t find an answer to (or a need for fresh snail meat), the Meat Collective Switchboard is there to help. It seemed like every food mag and blog in 2014 was obsessed with the “signature cocktail,” and I spent much of the year trying to figure out mine. I knew it was gin or bourbon-based, but that’s about as far as I got. The beverage in question need not be a completely original creation, but it should be a cocktail you can whip up for family and friends with confidence and aplomb each time. Simple, classic cocktails with a personal twist are ideal. To spark your imagination and try your hand at excellent cocktail recipes, you need not look any further than Bender, our monthly cocktail column in which Caroline Ferguson explores the social, cultural, and historical contexts of cocktails and other boozy beverages. Besides mastering the mixing, Caroline will make you an expert on the history of the drink itself, perfect for cocktail conversation. But before you can establish a signature drink, you need to have a basic bar in place. What exactly do you need for a basic bar? Vodka alone (with all of its gimmicky flavors) can be mystifying enough. Written by home bar enthusiasts, The Twelve Bottle Bar helps budding mixologists narrow their focus and curate a bar of the bottles they really need to mix a wide variety of cocktails. The book also has recipes for making your own bitters and garnishes, as well as suggested brands for every price point. Their website isn't bad either. 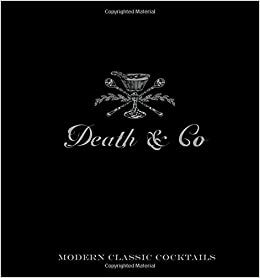 If you already know the basics, but want to dial up the fancy factor, check out Death & Co.: The Art of Modern Cocktails, from the NYC bar of the same name. If you can’t think of a signature cocktail of your own, one of theirs will more than suffice—just be sure to give credit where it's due. It’s fairly easy to make a delicious tasting dessert. Copious amounts of butter and sugar pretty much guarantee that the dish will be edible, and scoops of ice cream help to hide cosmetic flaws. To be fair, this is a pretty plate of ice cream. But if you want to take your presentation to a place that would make Ron Ben Israel proud, you're going to need some instruction, and a lot of practice. Brooks Headley’s Fancy Desserts (winner of Eater’s 2014 Cookbook of the Year Award) is the antithesis of the snobby pastry book. There are recipes for plated desserts as well as more home kitchen friendly options, but this book would be worth buying even if you have no intention cooking a single sweet. With humorous essays and a healthy dose of irreverence (see: "Fake Healthy Chocolate Chip Cookies With Lots of Salt"), Headley manages to teach the ways of precious pastry while keeping the reader from taking it all too seriously. If you’re the type who only orders dessert for the accompanying ice cream, make the first purchase of this year Jeni Britton Bauer’s genius book Jeni’s Splendid Ice Cream Desserts, which will not only teach you how to make ice cream, but incorporate your frozen creations into delicious recipes. The best part: this book is useful even if you don’t have an ice cream maker—the sundaes, crisps, and cakes can all be paired with the store-bought stuff. Those are my culinary goals for the new year. What are yours? Tell me in the comments! Even if you aren’t the type to make resolutions, hopefully the above resources will help make 2015 your most delicious year yet.